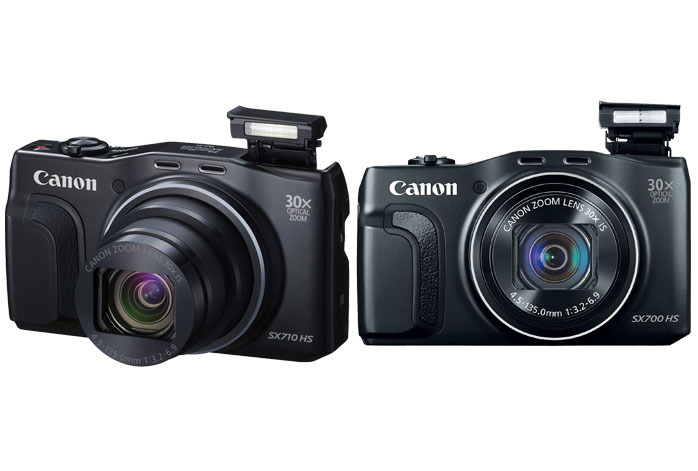 Are you confused in choosing between Canon Powershot SX710 HS and Canon Powershot SX700? Canon Powershot SX710 HS and Canon Powershot SX700 are both compact digital cameras with excellent performance and capture quality. They are also quite affordable, nice starting point before going to a more advanced DSLR or mirrorless model. However, which is the one you should choose? In the following article, you can find the comparisons between the two models to make your decision. Quite interestingly, Canon Powershot SX700 and Canon Powershot SX710 HS actually come with a very identical design. They are of the same size and weight, each is barely 113 x 66 x 35 mm and 269 gram. Obviously, these digital cameras are very compact and lightweight. They can be easily brought along and handled well. Some part of the surface is textured for better gripping. They each is armed with an integrated flash that can be pulled in and out of the body as needed, while on the rear side there is a 3” fixed-type display screen with dial controls. Both SX700 and SX710 HS come with built-in Wi-Fi and flash. The wireless connectivity is, of course, very handy, allowing you to seamlessly share photos and videos to other devices. With an internal flash ready, you don’t need to worry about low light conditions. Canon Powershot SX710 HS comes with an improved image sensor. The older Canon Powershot SX700S is armed by a 16 MP 1/2.3” BSI-CMOS sensor. Meanwhile, the newer model boasts a 20 MP 1/2.3” BSI-CMOS sensor. The higher native resolution allows the camera to capture images with better sharpness, crisp, and details. However, the maximum video recording quality remains the same between the two models, which is 1920 x 1080 Full HD. Unfortunately, the upgrade on Canon Powershot SX710 HS also brings a little bit of compromise. The newer model misses the microphone jack that Canon Powershot SX700 has. The feature can be important if you use your camera for recording professional videos; you may need an external mic to capture high-quality audio. In addition, Canon Powershot SX710 HS only has 6.0-fps continuous shooting speed while Canon Powershot SX700 offers 9.0 fps. If you need the microphone jack, you should go with Canon Powershot SX700. Otherwise, you can choose Canon Powershot SX710 HS for the higher sensor resolution for an improved image quality.